The standard bullnose edge provides a finished appearance and safe rounded corners. Construction: A 3/8" thick solid granite top layer is bonded to a 3/4" thick plywood core. Solid granite bullnose edges are also bonded to the plywood core. The underside of the granite table top is moisture sealed with epoxy and fiberglass. 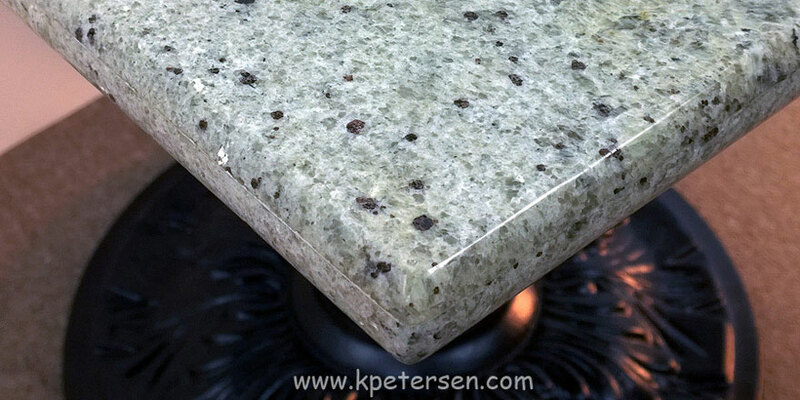 Polished granite table tops tops are scratch, stain and heat resistant. The sanitary table surface is perfect for restaurant use. Granite table tops can be used outdoors. Granite tops larger than 36" in two directions require a seam. Granite is a natural product. Variations in color and veining are to be expected in the stone due to quarry, cutting and block conditions. Mesas de granito restaurante. With proper care and maintenance, granite table tops will hold up well under normal commercial use. natural beauty and appearance of the granite. There are a variety of products available to CLEAN, protect, and seal stone surfaces. Good hardware stores or home improvement centers often carry such products. For products that can be purchased on line, we recommend Stone Care International www.stonecare.com . Clean with a damp cloth and gentle soap regularly. Keep covered when outdoors and not in use. Long term storage should be in a dry area. Do not use vinegar, cleaners that contain acid, abrasive cleaners or furniture polish. Clean thoroughly with a stone cleaner and reapply a stone sealer every 6 months.